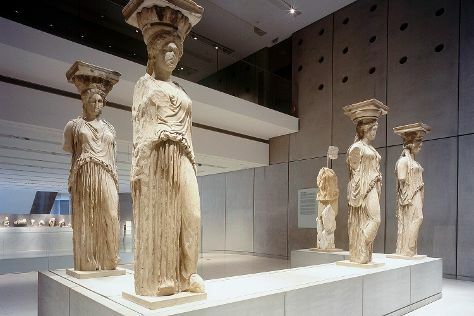 Start off your visit on the 15th (Thu): delve into the distant past at Temple of Olympian Zeus, take an in-depth tour of Acropolis Museum, and then explore the ancient world of Acropolis of Athens. Here are some ideas for day two: explore the world behind art at National Archaeological Museum, then admire the masterpieces at Benaki Museum, and then take a stroll through Plaka. To find photos, maps, other places to visit, and tourist information, use the Athens day trip planning website . Hamilton, Bermuda to Athens is an approximately 16.5-hour flight. The time zone difference when traveling from Hamilton to Athens is 6 hours. While traveling from Hamilton, expect a bit warmer days and about the same nights in Athens, ranging from highs of 39°C to lows of 29°C. Wrap up your sightseeing on the 17th (Sat) to allow time to travel to Lindos. A medieval settlement on the island of Rhodes, Lindos provides a mix of ancient history and modern attractions. 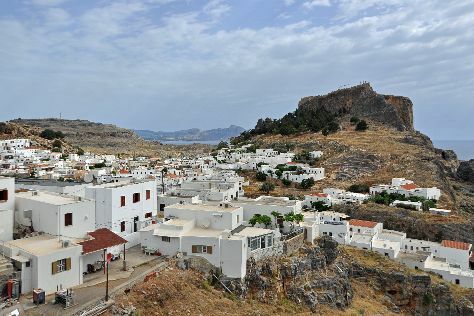 Kick off your visit on the 17th (Sat): explore the ancient world of Village of Lindos. Get ready for a full day of sightseeing on the next day: enjoy the sand and surf at Lindos Beach, contemplate in the serene atmosphere at The Church of the Panagia, then delve into the distant past at Acropolis of Lindos, and finally stroll through Agios Pavlos Beach. To see where to stay, more things to do, maps, and more tourist information, read our Lindos road trip app . Traveling by combination of flight and bus from Athens to Lindos takes 6 hours. Alternatively, you can do a combination of ferry and bus; or do a combination of bus and ferry. Traveling from Athens in August, you will find days in Lindos are slightly colder (36°C), and nights are about the same (29°C). Cap off your sightseeing on the 18th (Sun) early enough to travel to Heraklion. 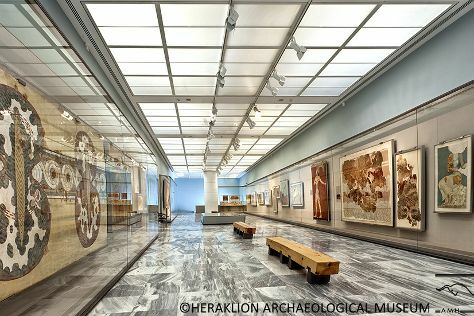 Kick off your visit on the 19th (Mon): take an in-depth tour of Heraklion Archaeological Museum, then stop by Irida Family Workshop, then explore the ancient world of The Palace of Knossos, and finally meet the residents at Cretaquarium - Thalassocosmos. On the next day, pause for some serene contemplation at Church of Saint Titus, learn more about the world around you at The Natural History Museum of Crete, then take an in-depth tour of Ιστορικό Μουσείο Κρήτης - Historical Museum of Crete, then ponder the design of Morosini Fountain (Lion's Fountain), and finally test your team's savvy at popular escape rooms. To see ratings, more things to do, and tourist information, use the Heraklion road trip planning app . You can do a combination of bus and flight from Lindos to Heraklion in 4.5 hours. Another option is to ride a ferry. In August, daily temperatures in Heraklion can reach 34°C, while at night they dip to 26°C. Cap off your sightseeing on the 20th (Tue) early enough to catch the ferry to Fira. Get a sense of the local culture at Akrotiri and Boutari, J., & Son Wineries S.A.. 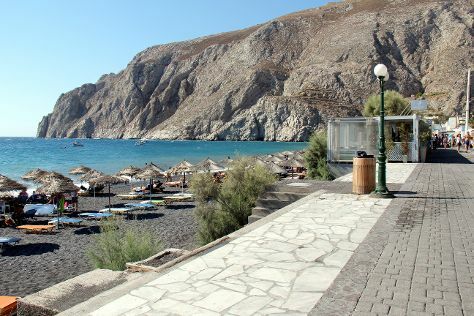 Step out of Fira with an excursion to Perissa Black Sand Beach in Perissa--about 36 minutes away. There's much more to do: contemplate the long history of Ancient Thera, explore the activities along Amoudi Bay, take some stellar pictures from Sunset in Oia, and take in the architecture and atmosphere at Panagia Theoskepasti Chapel. To find maps, other places to visit, ratings, and tourist information, use the Fira trip maker tool . Traveling by ferry from Heraklion to Fira takes 2 hours. In August, plan for daily highs up to 36°C, and evening lows to 28°C. Wrap up your sightseeing on the 24th (Sat) early enough to ride a ferry to Mykonos Town. Do some cultural sightseeing at Little Venice and Archaeological Site of Delos. And it doesn't end there: enjoy the sand and surf at Panormos Beach, stroll through Platis Gialos Beach, and make a trip to Rarity Gallery. To see photos, reviews, maps, and tourist information, read Mykonos Town trip itinerary builder site . You can ride a ferry from Fira to Mykonos Town in 2.5 hours. Another option is to fly. 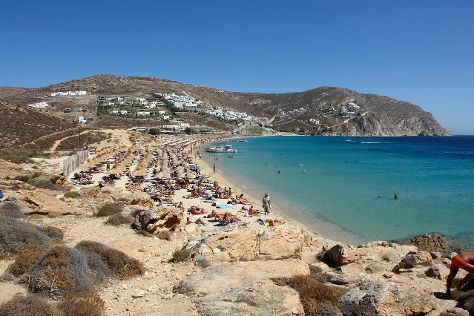 In August, daytime highs in Mykonos Town are 33°C, while nighttime lows are 27°C. Cap off your sightseeing on the 27th (Tue) early enough to travel back home. Kick off your visit on the 28th (Wed): wander the streets of Rethymnon Old Town, then contemplate the long history of The Venetian Fortezza, then stop by Platanes Shopping, and finally contemplate in the serene atmosphere at Monastery of Arkadi. Get ready for a full day of sightseeing on the 29th (Thu): explore the ancient world of Ancient Aptera, then examine the collection at Minoan's World, then examine the collection at Greek National Football Museum, and finally stroll through Old Venetian Harbor. To find other places to visit, reviews, and other tourist information, read our Rethymnon journey planner . Traveling by combination of flight and shuttle from Mykonos Town to Rethymnon takes 4.5 hours. Alternatively, you can fly; or ride a ferry. In August, daytime highs in Rethymnon are 36°C, while nighttime lows are 26°C. On the 30th (Fri), wrap the sightseeing up by early afternoon so you can travel back home. Hydra is one of the Saronic Islands of Greece, located in the Aegean Sea between the Saronic Gulf and the Argolic Gulf. Start off your visit on the 31st (Sat): ride a horse along Harriets Hydra Horses, enjoy the sand and surf at Vlichos Beach, and then admire the masterpieces at Historical Archive - Museum of Hydra. On the 1st (Sun), you'll have a packed day of sightseeing: get engrossed in the history at Lazaros Koundouriotis Mansion (National Historical Museum), tour the pleasant surroundings at Saint Nicholas Beach, and then make a trip to Mount Eros Hydra. For more things to do, photos, ratings, and tourist information, you can read our Hydra itinerary builder website . Explore your travel options from Rethymnon to Hydra with the Route module. In August, daily temperatures in Hydra can reach 39°C, while at night they dip to 29°C. On the 2nd (Mon), wrap the sightseeing up by early afternoon so you can travel back home.